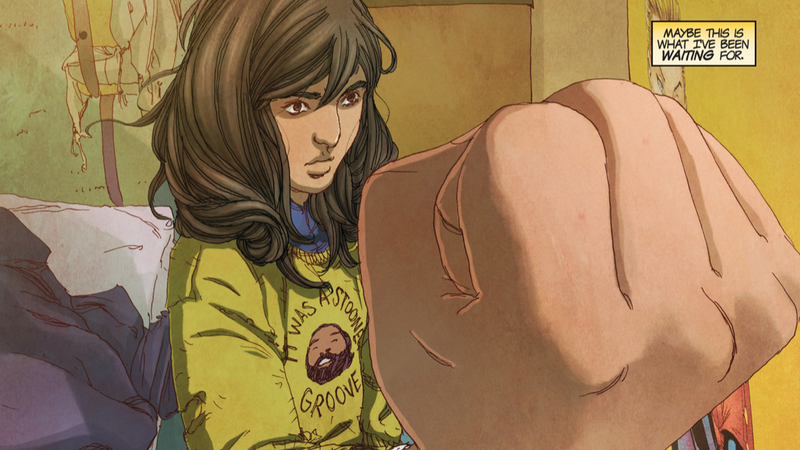 Kamala Khan using her ‘embiggening’ powers to increase the size of her fist. Pop culture plays a huge part in the process of transforming made up, nonsensical words into perfectly acceptable parts of the lexicon. Today, Merriam-Webster announced via Twitter that “embiggen”—a word that frequently pops up in Marvel’s Ms. Marvel series whenever Kamala Khan shapeshifts her body to make it larger—is one of the 850 new words most recently added to the dictionary. The official ruling (just the most recent to connect newly-added words to our favorite pop culture) gives embiggen the long-overdue recognition it deserves for being both an incredibly useful word and one of the greatest things to come out of The Simpsons. Though embiggen has definitely enjoyed more popularity because of its frequent use in Ms. Marvel, the word was first introduced (in a modern pop cultural context) in “Lisa the Iconoclast,” the sixteenth episode of The Simpsons’ seventh season. Outside of our favorite geek entertainment, embiggen actually predates “Lisa the Iconoclast” by quite a few years because it had been independently coined by TV writer Dan Greaney in 1996 and used in CA Ward’s Notes and Queries: A Medium of Intercommunication for Literary Men, General Readers, Etc. from 1884—in both cases the word referred to the enlarging of an object. The complete list of Merriam-Webster’s new words can be found here but now that embiggen’s on the books in the major dictionary, it’s time to get cracking on getting “cromulent,” meaning fine or acceptable, into common parlance.